The conflict over Christmas seemed to have reached its peak in the middle of the decade, and then to have died down since. However, in 2011, the "war" seems to have been revived. Many battles started up this year. Recognize the many religious and secular observances at this time of year of which Christmas is by far the most popular one. If so, then people might wish each other "Happy Holidays" or "Seasons Greetings" unless perhaps the other person would obviously be celebrating a specific observance. That is: whether everyone should follow the traditional status of Christianity in the U.S., or follow the emerging multi-faith and secularist reality. The choice is exclusivism or inclusivism. It is in response to America's increasing religious and spiritual diversity and the gradual loss of "market share" by the Christian religion. "politically correct. ... For the last several years, people have protested that the downtown parade ... had changed its official title. ... We find that extremely disturbing -- that a group that wants to be inclusive is so dead set and determined on excluding Christmas." Arnett did not appear to clarify how making a parade inclusive of all religions actually ends up excluding Christianity which is one of the religions being included. Arnett is organizing a competing parade, the Tulsa Christmas Parade for 2011-DEC-10 at 6 PM. This is the same day and time as the Parade of Lights, but will be held at a different location. This will introduce divisiveness in Tulsa by forcing citizens to choose between the two parades; they will not be able to attend both. "I don't want to compete. I love all those people. "So I don't want to be getting in the middle of a war. ... [People putting on the alternative parade] genuinely believe, as I do, that Christmas means the birth of Christ, and it has always been that way. So, it is not a war. It is not a conflict." This style of speaking -- in which two conflicting statements are expressed in successive sentences -- seems to be catching on among some politicians. It was pioneered by Herman Cain when he appeared to imply that he is both pro-life and pro-choice on abortion during an interview on TV. "... taking the high road [towards the alternative parade]. It's a free country. They're doing their deal, and we're doing our deal. We're trying to preserve this decades-old event for the families of Tulsa. ... Our event will truly reflect the diversity of Tulsa. ... Tulsa is made up of people of all races, colors and religions. Our goal was to reflect that, and to convey that we're open to participation by anybody." Everyone check this out, its time to stand up for what is right! This is disappointing. But when our elected representatives do not represent us, it is time for us to "represent" ourselves." Sometimes it is difficult to do things that you believe in. But then do you really believe what you believe in? Thank you for standing up for Christians! Amen to this! Thanks for keeping Christ in your Christmas celebrations. He is the real "Reason for the Season." Thank you for taking a firm stand to keep Christmas in Christmas. You GO Tulsa! Good job keeping the true meaning of CHRISTmas alive! This is great! Nice to know that Oklahoma still has people who will stand up for what is right! Thank you, thank you, thank you for keeping Christ in Christmas!! My family will be there celebrating with you all. Merry CHRISTmas!! Everyone is so afraid of offending a few. 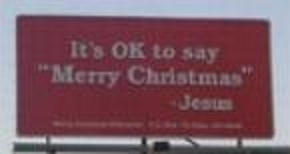 I wonder what they think of offending Christ. "How sad. The municipal government wants to be sensitive to the diversity of religious faiths in Tulsa by holding a parade that is inclusive of all faiths and none. But instead of increasing the religious cohesiveness in the city, a competing Christmas only parade is created." As noted above, I made an error in my posting: it is not themunicipal government that sponsors the traditional parade, it is a private group. I am wondering how long my posting will remain online. "What good is a holiday based on love, acceptance and giving if a simple parade cannot extend the welcome-ness to everyone of every background regardless of the 'title' it carries. The Bible doesn't state to celebrate Christmas so I highly doubt that that's where Christ will take his stand, I think he has more to be concerned about in this world than the renaming of a parade. Instead of putting Christ back in Christmas why don't we put him back in our lives 1st! Putting Christ back in our lives would allow us to take a stand on much more important issues in life other than a traditional parade... Like feeding the homeless and orphans, saving animals.... The money used for a second parade, I think it would be better if it was donated to giving poor children Christmas gifts.... don't you think Christ would appreciate that a little better? So when all the smugness settles down while you're in your warm cozy beds... you can remember that you got your "Christmas" parade and little children are cold and starving without gifts ...Yep I bet Christ is smiling... Whatta way to put Christ back into Christmas." Christmas in America (and worldwide) was supposed to be a celebration of the birth of the Savior. To transform it into some vague "winter holiday" or such, dishonors all those who believe in Him. So much for "pluralism" and "tolerance" in America today. If these anti-Christian leaders feel that way they should NOT be paid for not working on this CHRISTIAN holiday! they should be FORCED to be at work or be fired! What are the atheists celebrating? Why are they having a parade? You cannot take "Christ" out of Christmas no matter how you spell it. Actually, many Atheists are celebrating what they believe to be the true "reason for the season:" the approximately 23.45º tilt of the Earth's axis. This tilt produces the seasons, the solstices and equinoxes. Many Atheists observe the Winter Solstice -- which occurs about DEC-21 each year -- as a seasonal day of celebration. There are probably a few Atheists among the traditional parade organizers in Tulsa. However, they are certainly to be a small minority. The tilt of the Earth's axis accounts for the daylight hours shortening as the Winter Solstice approaches, and then reaching a minimum on the Solstice. This caused many aboriginal and pagan religious to hold a celebration after the Solstice when the days were noticably lengthening -- about DEC-25. The Roman Empire's Sol Invictus (Invincible Sun) celebration was one of these observations. It became the Christian celebration of Jesus' birth, even though he was actually born in the fall of the year.